The Mekong River Commission (MRC), gathering in Cambodia's Siem Reap province, will include a vote on adopting the next four-year plan for the riverine nations of Thailand, Laos, Cambodia and Vietnam. Representatives of China and Myanmar, both "upstream nations," will attend as "dialog partners" without voting rights. 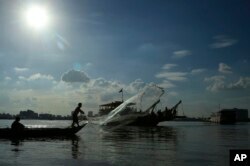 FILE - A fisherman casts his net next to a ferry in the Mekong River near Phnom Penh, Cambodia, Dec. 1, 2015. The livelihoods of 60 million people depend directly on the 2,700-mile-long Mekong River, which originates in China and empties into the South China Sea. Its fisheries alone were valued at $17 billion, or about 13 percent of the international trade value of fish as measured by the latest export forecasts of $130 billion for 2015. As a food source, the river "touches the lives of more than 300 million," according to the World Wildlife Fund. Any measure to regulate the river's flow, such as dams, has the potential to affect the member nation's economies and millions of lives. When the MRC was formed in 1995, China and Myanmar opted out, which meant they could skirt the rule requiring commission members to present dam proposals for discussion. Partly because of this, and partly because it lacks enforceable governing powers, the MRC has been criticized by some as an institution that has failed to safeguard the river from harmful projects. Maureen Harris, Southeast Asia director at International Rivers, an NGO, said communities in Thailand and Laos had reported impacts from some of these dams for years, without any formal acknowledgement or redress. "During the past two decades, the dams upstream have drastically altered the river's natural flood-drought cycle and blocked the transport of sediment, affecting ecosystems and fisheries downstream," she told VOA Khmer in an email. Convened every four years, the summit brings "together political leaders to address the prevailing challenges and opportunities facing the Mekong Basin," according to an MRC release. The summit will focus on the theme "Joint Efforts and Partnerships to Achieve the Sustainable Development Goals in the Mekong River Basin." The leaders' summit on April 5 will follow a preparatory ministerial meeting on April 4 and a stakeholders conference on April 2-3. FILE - This image from video shows a dam on the Mekong River in Laos. The summit comes after the second Lancang-Mekong Cooperative (LMC), when leaders met in Phnom Penh in January with Chinese Premier Li Keqiang. China and the five member LMC countries — Cambodia, Myanmar, Vietnam, Thailand and Laos — adopted a broad five-year plan on Mekong development that sidestepped setting forth measurable means for countering threats to the river from projects such as dams. Te Navuth, secretary-general of the Cambodia National Mekong Committee, said that the MRC summit is to reaffirm "political commitment" of the member nations to the 1995 Mekong Agreement. He added that they will review what has been done in the four years since the last summit and sort out what will be undertaken in the coming four years. "There will be a statement from Siem Reap," he said, adding that the leaders will continue to develop the Mekong River based on "solidarity, friendship and cooperation." But Te Navuth also raised concerns about the ongoing hydropower dams from other countries, such as Laos. "As the population increases, there are more demands for water," said Te Navuth, adding there is also more demand for energy. 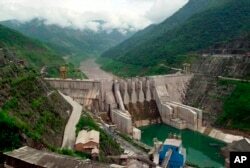 "There are big hydropower dams in other countries like Laos and China in the upper river. We're concerned. Therefore the head of governments will meet and discuss the opinions on Mekong management." China has already built eight dams on the river, while more than 20 others are under construction or being planned in Yunnan, Tibet and Qinghai, according to International Rivers. Cambodia has just completed another dam on a Mekong tributary, the Lower Sesan II, with a large mainstream dam on the Mekong River itself, the Sambor, in the planning stages. Laos is determined to become the "battery of Southeast Asia" and is building two highly controversial dams, Don Sahong and Xayaburi, while preparing the site for a third, the $2.3 billion Pak Beng project. With more dams planned, it has rebuffed complaints from downstream nations. Tek Vannara, executive director of the NGO Forum on Cambodia, said that prior to the summit, dozens of Cambodian NGOs, plus some NGOs from countries working on environmental and water issues, plan to make recommendations for the Mekong to the Cambodian government. This report originated on VOA Khmer.